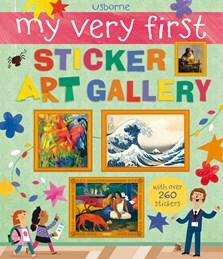 Young children can create their own art gallery of masterpieces with this brilliant book. Over 260 stickers to match to the correct frames to create themed galleries and exhibitions, including Pictures of People, Birds and Beasts and Everyday Life. Features reproductions of famous and lesser known works of art, along with background information about the artist or style. A fun and interactive way to introduce younger children to art and artists. Perfect for introducing young children to famous art and artists. A nice thick and beautifully produced sticker book... Usborne reign supreme when it comes to producing books on weighty grown-up subjects that are made interesting and engaging for children. A high-quality book and a lovely way to encourage children to enjoy art.